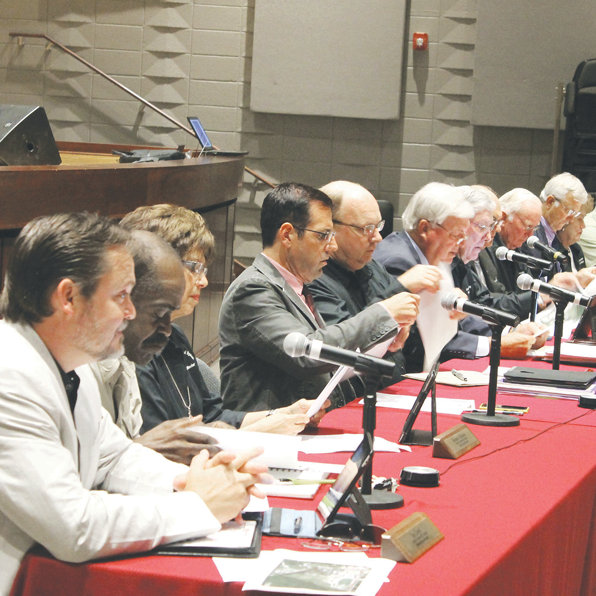 CENTRAL — The Central Community School Board and the Central City Council held their first-ever joint meeting last Monday to discuss the school board’s offer to give the city long-term use of office space for City Hall at the old Central Middle School site. Central schools Supt. Mike Faulk has recommended that the 26-acre site at Hooper and Sullivan be cleared, except for Wildcat Stadium and three buildings, the largest of which is referred to as the L-shaped building facing Sullivan. Faulk said 38,000 square feet of space is available in the L-shaped building and that it is worth renovating. He said the city could use up to 26,000 square feet of the space free of charge in perpetuity, if the city were able to renovate it. He estimated the cost at about $100 a square foot. City officials said they are in the process of selecting a city center and that the old middle school site is under consideration. However, Mayor Mac Watts said more time will be needed to determine which site would be the best. Councilman Aaron Moak questioned whether the old middle school auditorium should be torn down. Architect Phil Rutter said it would not be cost effective to renovate it. Councilman Wayne Messina said he liked the school board’s offer. Other city officials took a go-slow approach. Councilman Tony LoBue was out of town. No decisions were made during the meeting. City attorney Sherri Morris said any future agreement between the two bodies would have to be done through an intergovernmental agreement. CENTRAL — Concerned about the construction of commercial buildings with metal facades and undesirable building materials, the Central City Council Tuesday voted 4-0 for a 90-day moratorium on commercial construction. The Council wants the Planning & Zoning Commission to recommend new standards for building materials in that period. Councilman Tony LoBue, who authored the ordinance, said the Council could make exceptions to the moratorium for high quality projects. The moratorium affects new commercial construction on the Central Thruway and Greenwell Springs, Sullivan, Hooper, Wax, and Magnolia Bridge roads. Mayor Mac Watts and numerous citizens supported the moratorium. No one spoke against it.